I see you! Didn’t you promise that you’ll have the holiday season under control this year? You won’t be overcommitted and exhausted again...right? Each year I swore it would be easier. Juggling the shopping, cards, wrapping, events, decorating, traveling on top of my busy life got too hectic. I overextended myself by saying yes too often. I’m sharing tips I’ve learned about how to survive and thrive this holiday season. Saying yes to the joy, saying no without feeling guilty, managing time, scheduling self-care no matter what, and accepting that done is better than perfect. We get hit with so many requests for our time and donations. Pick and choose wisely. Which are most fulfilling? Do you honestly have the time? Then you might choose to say yes. Which drain you? 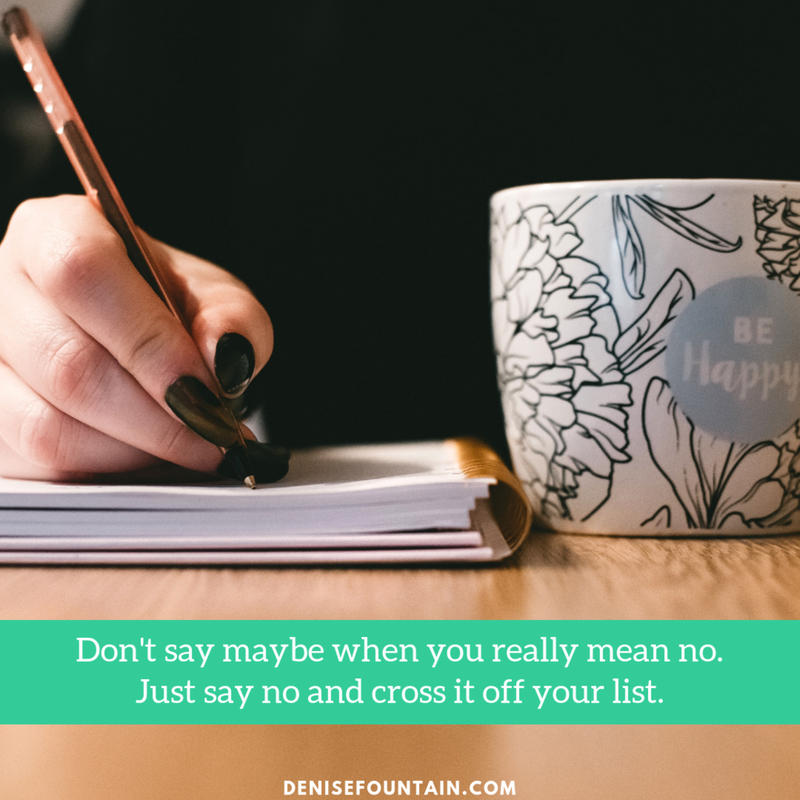 Say no, or find a way to feel good about saying yes. Decide what’s a should-do vs. a want-to. Shift your thoughts from a have-to mindset to a want-to mindset. It’s easier to make time for the things that you’re more energized about. Stop overcommitting. If you’re getting snappy or resentful at home or at work, dial back your commitments. You don’t have to organize the office holiday party - again - just because nobody stepped up. If it’s important to your co-workers, someone will do it. It’s not your job (unless, of course, it is). Let it go. The world will go on. You’ll have more time to take care of things that matter more to you. What do you want to holiday season to be like? Say yes to what brings you joy or gratitude. Stop feeling guilty because you “should” host a large sit-down dinner party, host out of town guests, or have the perfectly decorated Instagram-worthy home. Find another way thats not as overwhelming. Instead of a formal dinner, how about an open house with appetizers and desserts where everyone pitches in? Don't say maybe when you really mean no. Just say no and cross it off your list. You don’t have to be everything to everyone. You don’t need do everything for everyone else. You don’t need to do it all. When overwhelm and resentment from doing too much creeps in, the spirit of giving and generosity is lost. Either change your perspective so it feels good, or let it go. When you change your thoughts, your feelings and actions will change too. There’s no need to say yes to every request for your time, talent or finances. Pick and choose based on your values, and you’ll feel more of the joy and gratitude of the season. Ask almost anyone, and they’ll say need more than 24 hours in a day. But, hey, that’s all any of us have. Schedule events and tasks on your calendar. This makes it much more likely to get done, and shows you whether it’s manageable. Work backwards. Think about the fixed deadlines and commitments (delivery date for cards and gifts, scheduled events). Schedule in a realistic time commitment for getting tasks done (shopping, wrapping, mailing packages, volunteering, writing out cards, etc.). If you do community service work, work these commitments on your calendar. Schedule time for working out, relaxing and doing the things that keep you grounded. I use the calendar so that most shopping and wrapping for family and friends done before December. Gifts being sent overseas are a priority to wrap and ship early. I stay away from the frenzy of Black Friday. If that’s your thing, plan to get to up and out early. I shop for gifts pretty much year round while I’m traveling. This year, I shopped in Italy for small, flat and packable unique artisan gifts. Amazingly, our suitcase zippers didn’t explode and we took care of a lot of our gift list. Adopt-a-family shopping is finished early so it’s wrapped and delivered in plenty of time. Yet, I still have some last minute shopping and wrapping. But it’s fun, not frantic. With most done ahead of time, it’s not stressful. It’s fun to be a part of the busyness without feeling overwhelmed. I like the festive atmosphere of ribbons and bows in the wrapping room (aka known as my son’s former bedroom). Done is better than perfect. Be done! Let go of the guilt and order pre-printed holiday cards...today. For years, getting holiday cards written stressed me out. The perfect, cozy and completely improbable fantasy I had of peacefully relaxing and writing cards by the fireside was totally ridiculous. Some years I even skipped sending cards completely because they weren’t done in time. Really, who cares! Sending holiday greetings late is better than not at all. But this is really, really hard for me to do. There are no gold stars for perfectionism! Now I’m at a happier place with holiday cards. New Year’s Cards are the perfect solution. I find quiet moments during my week off, taking the time to send out cards without the usual pre-holiday stressful time crunch. Works for me! If you don’t like giving cash or gift cards because it seems impersonal, consider this: some people would really, truly rather have the freedom and flexibility to choose something exactly right for them. Simple for you + appreciated by the recipient = perfect gift. Why not! Teens and tweens love to make their own purchases, and would love more money to choose exactly what they want. Teen drivers enjoy gas cards to help them get around town. College students treasure cash, and can use it for fun or for school expenses. People who are pretty particular (aka picky!). If they’re going to return the gift or never use it, make it easy on both of you by sending a gift card or check. New homeowners, or people saving for a home appreciate the flexibility of cash or gift cards. A gift card to a favorite restaurant or shop is a thoughtful indulgence when they’re trying to save as much as they can. People on fixed incomes may like the freedom to choose their own splurge, or to use the financial gift to help ease finances, while respecting their pride and privacy. Anyone who is downsizing doesn’t need more stuff! For instance, my parents certainly don’t need cash, they also no longer want more things. Gift cards to their favorite jazz club or special occasion restaurant delight them. Teachers and school bus drivers have all the mugs, calendars and ornaments they will ever need. Really. I promise. The thought is nice, but so is a gift that they can use. For the person who doesn’t want a gift, but you want to give one anyway, consider making a donation on their behalf to a charity near and dear to their heart. Save your time and patience. If you know exactly what you want, buy it online. Save the hassle of hunting for a parking space and waiting on line. If you need to browse, shop early or late to avoid the biggest crowds. When the holiday season picks up, you know what happens. You’re busy, overcommitted, rushed, and stay up late. It’s the exact opposite of what your mind and body needs to function well. Too much caffeine and not enough sleep leaves you feeling anxious and jittery. Before you know, it you’re wired and tired. Cranky and crabby. Running on empty. The cycle continues. Slow down. Find a quiet space to regain your equilibrium. Getting enough rest is one of the best things you can do for your mental and physical health. You’re worth it. You’ve heard it before. Social media posts and pictures are not real life. It’s easy to feel like you’re not measuring up to the picture perfect images that are everywhere. That beautiful holiday card with the smiling family. The breathtaking taken at the top of Mt. Everest. You didn’t see the backstory with the dozens of outtakes or the exhausting trek to the summit. Real life gets edited, leaving just the best of the best to make the cut. Everyone has bad hair days, burned dinners, uncooperative pets and family. You are not alone. Don’t measure your everyday moments to the pictures and posts you see on Facebook and Instagram. This holiday season, join me in letting go of the quest for doing things perfectly. Instead, find joy in being realistic. Let go of impossible goals and commitments. Simplify gift giving while giving presents that will be a delight to receive. Take care of yourself to keep your mood, energy and health strong. Stop trying to measure yourself against impossible standards so you can enjoy the season. Turn down the stress and turn up the joy. And if you need some sanity saving help, book a Clarity Call with me today. Here’s to surviving and thriving this holiday season!